I was sent a copy of this to review (thank you Usborne), and was keen to see how it was, especially after enjoying other recent suffrage-inspired titles (notably Make More Noise and Things a Bright Girl Can Do). I hadn’t realised at the time that this was a) a new edition of an older book or that b) the book was part of a series, but I’m very glad it is (part of a series that is). Originally published as ‘Polly’s March’ as part of the Historical House series in the early ’00s, this is one of 6 books written by Linda Newbery, Ann Turnbull and Adèle Geras. Each book tells the story of a young girl living at 6 Chelsea Walk, but all at a different point in history, and each would appear to champion the following of dreams and self-belief. This is the only book I’ve read in the series (so far!) but as and when the others are re-issued (mostly later this year I think) I’ll be diving back in. Polly longs to be an explorer. But in 1914, women’s rights and choices are limited – something Polly learns when she befriends her new neighbours, two suffragettes. Polly’s parents are appalled, but Polly is intrigued. The more she thinks about their cause, the more determined she becomes to join their protest march. But will she dare to defy her parents and do what she thinks is right? As Polly meets her new upstairs neighbours, Violet and Edwina, she discovers more and more about the fight for Votes for Women: both the peaceful protests and the more forceful ones, hunger strikes and the ‘Cat and Mouse’ act, and famous women in the cause: the Pankhursts and Emily Davison. If this book is anything to go by, this series will fill a gap perfectly, both in terms of books with strong female main characters, and in a more general sense in that it is perfect for those readers just ready to move on from ‘younger’ chapter books and onto more solid ‘MG’ territory, but not quite ready for some of the longer books or those with considerably older subject matter yet. Likewise, it will be a great way into various historical times and events – a brilliant ‘springboard’ onto other historical fiction (Emma Carroll anyone?!) or non-fiction reading. Striking a great balance between historical facts, setting the scene realistically for the time period and the ever-relatable occurrences and emotions of everyday life, this is a quick but enjoyable read with a likeable main character. Friendship, courage and determination with a dash of early rebellion set at a turning point in history. “Don’t judge a book by its cover.” Do any bookworms actually follow this advice? I know (following a recent #banterwithbooksellers over on twitter) that myself and many of my fellow booksellers definitely do not, instead “Magpie Reading” (term coined by Ceris!) – homing in on those books with beautiful/intriguing/unusual covers. And that was definitely the case with Sylvia Linsteadt’s ‘The Wild Folk’. As soon as this appeared on my trolley for shelving, I felt that Magpie at work: the cover is gorgeous. But this is no surprise when you find out it was designed by Sandra Dieckmann, creator of ‘Leaf‘. As with the illustrations in Leaf, the cover of The Wild Folk is bursting with life, and as with Leaf, as well as being a fantastic, folklore-style adventure The Wild Folk also contains a pretty stark message about the importance of looking after our ‘wild world’. Their task is to save the mystical Wild Folk from destruction. But the Wild Folk don’t trust humans, and the children face impossible challenges and meet extraordinary creatures as they battle to save the land they love. But, and it’s an important ‘but’, they are unique enough, important enough to the story and well-written enough to avoid cliché, and there is enough about the story which is entirely new and original to balance out the areas that tread some familiar ground. For me, this is huge in showing the promise of a book that will not only be a thoroughly enjoyable read, but one that will stand both the test of time and multiple re-readings, and I think the Wild Folk (and it’s sequel – due in Spring ’19) will do just that. Cleverly beginning by switching between our City-dwelling hero Tin and his (in no way mousey) Country-mouse counterpart Comfrey before gradually bringing their stories closer and closer together, until they meet and their stories merge worked incredibly well. Firstly, this provided an opportunity to really get to know our main characters – both Tin and Comfrey, and Myrtle and Mallow: the two leverets sent to aid them on their quest. All are incredibly likeable without being at all flat, and very much bringing their own qualities, personalities and voices to the story. It also served brilliantly to delve into the background of City and Country and show the differences in lifestyle and beliefs between the places. As with the characters, each place has a distinct feel to it and each world is built wonderfully (as are the various places the children travel through around Farallone on their quest): there is a dark and grimy, almost steam-punk feel to the City which contrasts superbly with the wholesome, old-fashioned feel of the Country. Through this, it is impossible to ignore the messages that run through the book, both environmental and social: the devastating effect ‘Fake News'(to use some much more modern terminology! ), segregation and fear of differences can have, not to mention the devastating effect humans can – and do – have on the wild. With City, Country and Wild folk all mistrusting and judging each other, pre-conceived ideas and must be addressed in order to save Farallone. The book has more than a touch of folklore and fairytale magic to it (it has a map, which is always a promising start!). Upon encountering the word ‘tatterdemalion’ (what a wonderful word it is too!) I needed to look it up and found that Linsteadt also has an adult novel with the same title which is also firmly rooted in myth and legend: she clearly has a passion for it and a writing style that is more than up to the task if The Wild Folk is anything to go by (watch this space for a review of Tatterdemalion at some point!). There is the story of Farallone itself – the legend which provides the backbone of the book, then there are smaller tales-within-the-tale passed down through generations of country/wild folk. The story itself encompasses many characters and events which feel like they’ve stepped straight out of a folk tale or fable – The Greentwins are a case in point – as well as deliberate re-imaginings: the chapter on the Baba Ithá was one of my favourite parts in the whole book – loved it, LOVED IT, LOVED IT! Highly recommended for older MG readers (or those who enjoy a longer, more challenging read), as well as adults and older readers who enjoy a healthy dose of folklore in their reading, this is a highly original, incredibly well-drawn fantasy adventure. With Grizzly Witches, underground networks and mechanical spiders, Fools and their Oddities and a stunning setting brilliantly described this is a fantastic story not to be missed. Thanks to Usborne for my review copy. When a polar bear arrives unexpectedly in the woods, the other animals fear and avoid him, suspecting him to be dangerous – and his odd habit of collecting leaves only adds to their distrust. Then one day, they watch as he attempts to fly over the water with wings made of colourful leaves… trying to get back home. Perhaps he isn’t so different after all? 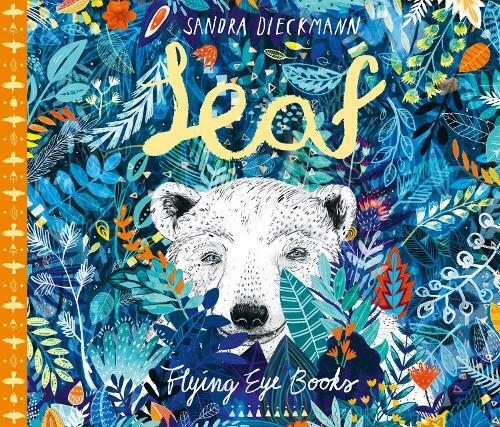 One of my favourites on the Waterstones Children’s Book Prize illustrated Book Prize Shortlist this year, Leaf is a simply stunning picture book fully showcasing the lush vibrancy of the natural world in its gorgeously leafy pages. The story itself is equally touching, with an immensely relevant message of togetherness, hope and friendship in these crazy times we seem to have found ourselves in: a message to not only look after our struggling planet, but our struggling neighbours here on it, no matter how different we may at first seem. The speech bubbles, actions and disagreements of the animals living in the woods Polar Bear finds himself in add plenty of extra talking points, particularly for use across the primary age range and would wonderfully complement any work being done on either conservation/refugees/immigrants/differences/prejudice amongst other things. This is a fantastically important and enjoyable story with massive visual appeal across the ages. A must-read. Our ‘Leaf’ creations at storytime! Sandra Dieckmann’s eagerly awaited (by me anyway!) next picture book ‘The Dog That Ate the World’ is due out in July. High above the bustle of the city are eyes that watch and hands that know – it’s time to pause the clock. When Liesel spots the city wearing a frown, she decides it’s time to stop the clock and lend a helping hand. While the city sleeps, she carries out little acts of kindness to breathe colour, life and happiness back into the city. This is one of those picture books that really is for everyone. The cadence and phrasing of the text (there are some absolutely beautiful turns of phrase in here) combined with the expression and detail in the images surrounding it give the book the feel of an illustrated poem rather than the traditional story-style found in most picture books giving it wide-ranging appeal. Introducing its setting and themes – a busy day in the grey, rushing, crowded-but-isolated city – beautifully with the ‘characters’ Lost, Lonely and Stuck in the first couple of pages, this is a book that will resonate with many an adult who’s lived/worked in the city (even those of us, like me, who love it!) The situations we meet them in will be equally recognisable for younger readers – playing alone, a lost teddy, an argument from people who don’t want to share. The illustrations alone offer SO much to pore over, talk about and consider – from a whole host of different people (and their body language and facial expressions) to familiar settings and situations (and the comparisons and “what if’s” that can be drawn from them), and that’s not to mention Liesel’s ‘Random Acts of Kindness’ (for want of a better description) and the fantastic vocabulary in the text. While it’s an ideal book to share one-to-one, I also think this has so much potential for use in school settings, right across the Key Stages. A breath of fresh air through a grey city day – this is a gentle meander through the city as time stands still and a reminder to pause and really notice what’s around us now and then in the midst of hectic lives. When I was little I loved stories about dragons, notably Margaret Greaves’ ‘Charlie, Emma and the Dragon…’ series and June Counsell’s ‘Dragon in Class 4 series’. I wrote story after story about them too – as evidenced by one of my earliest, more gruesome tales below…! Following in the footsteps of some of the aforementioned dragon-ish chapter books I read and loved as a child, this has all the hallmarks of a great younger read: familiar settings of school and home; characters who are recognisable (family members and friends, with that not-very-nice school ‘bully’ and grouchy next-door neighbour for balance) and most importantly – that chaos I was talking about earlier! Imagine the uproar a dragon could cause, especially one you’re trying to hide, and especially when you know they have exploding poo, a tendency to fly off and flame-breathing skills they’ve yet to master! Combine the two and it makes for a riot of a read: familiar scenarios are turned into hilariously sticky situations by the appearance of a flame or poo or two (flying books, kitchen carnage, scorched shorts) and that’s when there’s only one dragon! Luckily for his friends, who also want a dragon (quite frankly, who wouldn’t?! ), more dragonfruit start appearing on the tree, but if one dragon causes this much trouble, what will happen if more hatch…?! A brilliant start to what promises to be a fantastic new series for younger readers. Sara Ogilvie’s illustrations are fresh, lively and more than up to the job of capturing the warmth, havoc and humour of the text. Recommended for fellow dragon-lovers everywhere! One small girl. An unexpected detective. A handful of suspects. All aboard the night train, where no-one is what they seem. As Max takes off on a thrilling journey across Europe by train, can she unravel the mystery of a priceless missing diamond and find a way to bring the jewel thief to justice? Off to visit her Great Aunt Elodie in Istanbul, Max sets off by train and unwittingly stumbles into the role of detective as she finds that the suspect (and diamond!) from a recent burglary are thought to be on board the train! Each chapter of the book is set on the next stage of her journey and sees us whisked from Paris through Munich, Budapest and Bucharest to Istanbul. I loved the time we ‘spent’ in Budapest particularly: the description of the place combined with the humour of Max’s investigative attempts were pitch-perfect and had me smiling right through. And this is common throughout the book. The way in which each destination is described is so cleverly done: this is not a book full of flowery, scene-setting paragraphs but I felt I’d just stepped off the train with Max at every stop: each place given a distinct character, geography and culture with just a few well-chosen details dropped into the story or Max’s first impressions of places and without it interrupting the flow or the pace of the story. Max is an immediately likeable character and with a voice that feels very believable and just right for her age: while she falls into role as sleuth, she is not suddenly an expert nor bursting with confidence, she’s still slightly unsure and a careful thinker. Similarly, she is curious: yearning for an adventure to break the everyday routine and dreaming of seeing the world, but when on her way is still as apprehensive as any child leaving home for the first time would be. From Sister Marguerite and her Mary-Poppins’-bag-like-habit to the clumsy Robert to the frightfully bolshy and rude Ester and knitting ‘hulk’ Klaus, all of the characters have a touch of the eccentric and absurd about them. But they all have back-stories and well-drawn personalities which make them much more than caricatures and, while retaining a huge dollop of humour, become just as enjoyable to read and root for (or against!) as Max is. The story itself is fast-paced, witty and a carefully balanced mix of slapstick (the scene at Marek, Marek es Ruszy springs to mind! ), twist-and-turn-filled adventure, mad-cap plans and suspects with secrets to hide. It whizzes along and keeps you guessing along with Max about who the culprit could be (some parts are more easy to work out than others, but it doesn’t spoil the fun!) With perfectly suited, lively illustrations that are equally full of character from Marco Guadalupi, this is a very enjoyable read!